Meet Craig and Julie Sedelmeyer, a Houston couple who left the oil and gas industry to pursue a more fulfilling life as small business owners. Tired of the corporate routine, the Sedelmeyers found an opportunity in The Groutsmith few other franchises offered: a chance to learn a new professional skill, reconnect with their community, and achieve a more comfortable lifestyle. This is their success story. Craig and Julie Sedelmeyer both worked in the oil and gas industry prior to becoming Groutsmith franchise owners. Neither had experience in business ownership or grout and tile work before bringing The Groutsmith to their area of Houston, Texas. The Sedelmeyers chose The Groutsmith because it had everything they were looking for in a franchise opportunity: an established business model, a strong support system, a low up-front cost, a simple royalty structure and the ability to easily manage their growth as business accelerated. Craig and Julie feel the business fits nicely with each other’s strengths––even without any prior experience. Craig manages their technicians and performs estimates while Julie mainly oversees the admin tasks back at their home office. While their business is only about a year old, the Sedelmeyers are poised to grow significantly as they continue to scale their business. Read the full story, packed with Craig and Julie’s own words below. Before buying their franchise, Craig and Julie both built careers in the oil and gas industry. Frustrated with the lack of control and choice in their roles, they decided to make a change and pursue business ownership. While going from corporate careers to buying a franchise might seem like a leap, Craig says the skills he gained from his prior role gave him a huge advantage as a Groutsmith owner––specifically, a commitment to customer service and a dedication to high-quality work. Knowing they wanted to hit the ground running by buying a franchise rather than starting a business from scratch, the Sedelmeyers went searching for an opportunity that satisfied a few important criteria. Specifically, they were looking for an established business model, a strong support system, and an opportunity to connect with customers in their homes rather than in a retail environment. 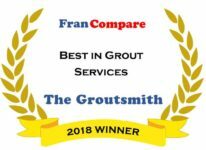 Looking back on what made The Groutsmith stand out among other opportunities, Craig says a few major benefits resonated with them in a huge way. Financially, the Sedelmeyers point to the sliding scale royalty structure as a huge benefit that has enabled them to see long-term success with the business. Learning a new skill and taking it to an expert level can be difficult and time-consuming without the right training program. 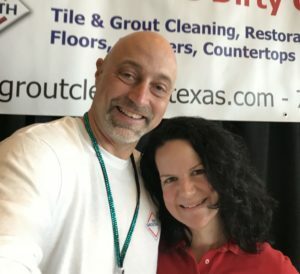 The Sedelmeyers are proof positive that The Groutsmith’s two-week training program can turn folks with zero grout and tile experience into experts eager to capitalize on their newfound skills and impressive products. When asked what they enjoy most about being a Groutsmith franchise owner, the Sedelmeyers point to the flexibility and lifestyle they simply couldn’t get in the corporate world. Craig and Julie’s advice for anyone thinking about franchising with The Groutsmith is simple: it’s not rocket science! The business and the training that comes with was specifically developed to transform complete newcomers into skilled experts.